Amanda has been with Dr. Sam’s since 2013. She admits to being quite nearsighted, and understands how being able to see well impacts her own life. 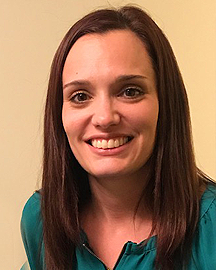 Amanda has empathy for folks with vision challenges, loves helping others see well, and enjoys connecting with patients. When Amanda’s not at the office, she likes hiking, reading, hanging out with her family, and watching movies (she says she’s seen the coming-of-age baseball film, The Sandlot, over 200 times). She also enjoys auto racing (as a spectator) and is thrilled to be able to read the numbers on the cars as they fly past. Her favorite color is (can you guess?) green, and her favorite sight is her kids.